Cobalt Seniors and Shepherd Health announce Shepherd Living at The Range, an upscale 124 resident community offering spa-like living on roughly 14 lush acres in Madison, a growing suburb of Huntsville, Alabama. Cobalt Medical Development is the most recent company to join March LifeCare in Riverside County, signing an agreement to purchase four acres on the growing medical campus. FARGO — Richard Fiske has been setting up and operating rehabilitation hospitals for decades, and one thing he has learned is that a bed is about the worst place to spend time when someone is recovering from something like a stroke or other brain- or spine-related injury. Richard Fiske, CEO of Cobalt Medical Development, was featured on the home page of Mayor Sharon Wolcott’s website after picking up the official building permit for the Cobalt Rehabilitation Hospital of West Phoenix. The picture and short article can be seen by following the link below. Cobalt Medical Development held the official Groundbreaking ceremony for its 60-bed Inpatient Rehab Facility in the heart of the Mid-City/Biomedical district of New Orleans. Click the following links to download and view the articles. Cobalt Medical Development was featured in the May/June 2014 issue of D CEO for its focus on the rehab needs of those with Traumatic Brain Injuries. Click the following link to download the article. Surprise, AZ (November 5, 2013) The Surprise City Council is poised to take action next week on a new medical facility that creates 125 new healthcare jobs and represents a $15 million capital investment to Surprise. Dallas-based Cobalt Medical Partners (CMP) told Council during Tuesday’s Work Session of their plans to construct a 50,000 square foot facility with 40 beds on three acres at the northeast corner of Bell and Dysart roads. “We are bringing a whole new level of medical service to the community,” said Richard Fiske, Chief Executive Officer. “Our advanced rehabilitation center will specialize in treating traumatic brain injuries of military veterans, first responders, athletes and the general public.”“A project like this aligns perfectly with the Council’s Strategic Plan,” said Mayor Sharon Wolcott. “Job creation and the recruitment of new healthcare operations are cornerstones of the plan.” As part of the Development Agreement the city would pay on behalf of the project $160,000 in building permit and plan review fees. The city will coordinate a job fair to assist CMP in the recruitment of new employees. The City will also provide research, guidance and general assistance to CMP regarding employee training grant opportunities. 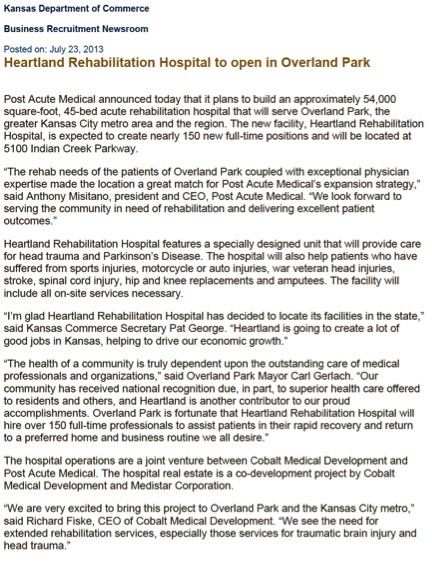 Cobalt is anticipating opening their Surprise facility in late 2014. The City Council is scheduled to vote on the Development Agreement at their November 12 Regular Meeting.